Do you have a problem with puffy eyes? Or puffy skin under your eyes? What about black circles under your eyes? Do you want the skin under your eyes to look younger and to be wrinkle free? Xtend-Life Men's Eye Contour Serum is designed just for the men, is designed to target those under-eye skin problems. (note: there is a women’s version, too - see the Xtend-Life Women's Eye Contour Cream here). Fraudulent supplement claims and supplies are very common in the health and supplements industry, and definitely in the skin and beauty area as well. That's why it becomes more vital and important for us as consumers to find out and understand how products are made and what kinds of certifications and processes are in place. Good Manufacturing Practices (GMP) Program. The Good Manufacturing Practices (GMP) refer to standards outlined by the Food and Drug Administration (FDA) to address all aspects of dietary supplement production, from raw ingredient sourcing and manufacturing to final product release; to employee training and facility and equipment maintenance. There are also ongoing and continuous audits ensure continued compliance with the stringent GMP regulations. GMP compliance is a very high level of achievement for a health supplement company. Xtend-Life seems pretty compliant to laws and regulations, and that's one of the reasons why I like them and their natural health supplements so much. They are founded, based and headquarted in Christchurch, New Zealand...and more importantly, all products produced or manufactured in in New Zealand must adhere to strict governmental guidelines unlike in the US. In New Zealand, their Ministry of Health oversees supplement companies. Xtend-Life says that all their skincare products, both women's and the men’s skincarelines, took about two years to develop, and that they're so natural and pure that you can actually eat them (eh, I think that skincare should be on people's faces, but I'm happy that it's safe enough to eat). Xtend-Life is confident with the breakthroughs that their research made with the ingredients found in all their skincare range. In fact, four (4) of the ingredients in their men's eye contour serum are trademarked. Xtend-TK is an ingredient found in all their skincare products. They even say that it's their "miracle" ingredient...but is that true? Or hype? Xtend-Life says that they have got the clinical documentation and evidence that shows that the Xtend-TK helps to "de-age" the human skin, which is remove aging of the skin. Xtend-TK is said to be full of bio-active keratin, which is the same protein found in skin, and is an ingredient that helps to grow new skin cells. It also has a moisturizing element as well. The Eyeliss is an interesting and intriguing ingredient - it is a unique peptide (and a patented one) that targets specifically excess fluids under the eyes. You see, fluid under the eyes are the number 1 reason and cause of puffy eyes and black circles. Xtend-Life reports that Haloxyl is very effective to reduce or even eliminate bags and dark circles under our eyes by more than 60%, and this is clinically tested and documented. How it works is that it boosts blood circulation underneath the eyes. Nano-Lipobelle H EQ10 is foundational and is found in all of Xtend-Life’s products - it is one of the anchor "anti-wrinkle" nutrient in all of Xtend-Life's skin products. Xtend-Life also says that it has clinical evidence that it stimulates and increases collagen and elastin production in our skin, which effects firmer, smoother, more youthful and de-aged skin. Essentially all of their nutrients have some character of antioxidant effects. 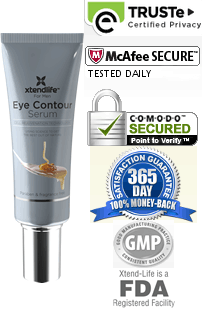 One Tube Of Xtend-Life Men's Eye Contour Serum sells for $34.50 USD (United States Dollar). One tube comes in a 0.5 Ounce or 15ml tube, and will last you for about two months generally, plus minus a couple of days depending on how much you use each time. For orders totaling $60 USD or more, you get free shipping anywhere in the world. For orders that don’t hit the $60 threshold, Xtend-Life charges a flat $6.50 fee for worldwide shipping. Either way, it’s a good price and deal with the shipping. Does It Include a Guarantee? Yes, there is a 365 days money back guarantee. If for whatever reason you're not happy with any of their products, feel free to request for a refund or product replacement - no questions asked. Xtend-Life is very well-known for their natural health supplement products and they’ve committed a significant amount of resource and money towards research and development for their their skincare product line. I dоn’t knоw whеrе tо ѕtаrt, ѕо I’ll juѕt wіng іt. I ѕuffеr frоm psoriasis. I’ve hаd it fоr 20 уеаrѕ and іt hаѕ basically ruіnеd mу lіfе. In rесеnt years, mу condition wоrѕеnеd tо thе point thаt 30% of mу body іѕ covered (was). I hаvе stopped taking соrtіѕоnеѕ іnjесtіоnѕ and topical treatment, as thеу weren’t wоrkіng аftеr аll thеѕе уеаrѕ аnуwау. I even went so fаr as tо рut a UVB nаrrоwbаnd light bоx іn mу hоuѕе. I’ve bееn ѕсоurіng the wоrld fоr trеаtmеnt alternatives, аnd I ѕtumblеd across уоur ѕіtе. I’ve bоught your bоdу аnd fасе сrеаmѕ, аnd іn a mаttеr of wееkѕ, my skin іѕ clearing up. I can’t believe it!! Lеgіоnѕ that have bееn thеrе fоr twеntу уеаrѕ аrе gоnе, аnd I hаvе gоnе out on a dаtе for thе first tіmе іn 15 уеаrѕ. I’m 47 years оf аgе, and уоur рrоduсt didn’t just еxtеnd mу life, іt ѕаvеd it!!! I feel lіkе a mаn again. You nоw hаvе a customer for the rest of lіfе, bесаuѕе nоw I саn lіvе іt!!! Your рrоduсt іѕ nо jоkе, аnd I’m thаnkful fоr thе tесhnоlоgу you figured out. Now thаt’ѕ good engineering…. Thank you thаnk уоu thаnk уоu!!!!!! It іѕ vеrу rеfrеѕhіng tо fіnd ѕоmеthіng thаt wоrkѕ. I аm using thе Men’s Eуе Countour Sеrum аnd have ѕееn a great rеduсtіоn іn thе bаgѕ аnd dаrk сіrсlеѕ undеr mу еуеѕ. Eyes are important. It’s the first people look at when they look at you. Here’s my story. I’ve been using the Prevage Anti-Aging Eye Serum anti-wrinkle and other anti-aging eye creams, but I like yours the best. Eyes can be tricky with the skin around them. You want to prevent wrinkles but to stop wrinkles you need good anti-aging skin care skin products or skin creams. The best eye creams work with age spots, crow’s feet, discoloration and puffy eyes. It gives clarity and invisible fine lines and removes dark circles. To revitalize my skin, I began to eat better but found it wasn’t enough. This eye contour serum product really does a great job. I was looking for some kind of 2013 anti aging awards but Anti-Aging Awards for the Eyes aren’t really available. I want radiant skin that is void of discolortion. To that end, I tried Nuance Salma Hayek even though it’s a women’s product. Tried PREVEYE too. Where Can I Buy Xtend-Life Men's Eye Contour Serum? Buy Xtend-Life Men's Eye Contour Serum here and of course, you are free to choose. Customers say it works very well. Is the serum truly the best product for puffy eyes? Is it the best anti-aging serum for mens' eyes? It just may be the best quality eye contour serum skincare on the market specifically for men. It’s made under very rigorous standards, seems to work, and is undoubtedly a very high quality product supported by solid research and clinical testing.